Owen Hargreaves has admitted defeat in his bid to join Manchester United, according to his agent. The England midfielder was keen to leave Bayern Munich for Old Trafford, but the German club have refused to sanction the transfer. Hargreaves' agent Roman Grill said: "We have to accept there is no way Bayern will allow this transfer to happen. "His only hope is that if United remain interested in him the deal could happen at a later date." United have been chasing Hargreaves and were thought to be willing to pay £17m for the player, who was one of England's few success stories at the World Cup. But Bayern general manager Uli Hoeness underlined his club's intention to hold on to Hargreaves, even after the arrival of Mark van Bommel. Hoeness said: "Owen stays - you can bet your house on that. Manchester United will have to plan without him." 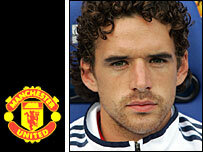 It had been thought Van Bommel's move from Barcelona could pave the way for Hargreaves to join Manchester United. Van Bommel himself was quoted as saying Hargreaves was "close to leaving". But Hoeness again insisted on Monday: "We want to move forward with Mark and Owen. We would be crazy to sign Van Bommel as a replacement for Hargreaves." Van Bommel has signed a three-year deal, believed to be in the region of £8m, with the German giants after undergoing a medical on Monday. He is now being seen as a replacement for Germany captain Michael Ballack, who moved to Chelsea earlier in the summer. But when speaking prior to completing his move to the German club, Van Bommel had been quoted as saying: "I have left Barcelona because there were not enough guarantees that I would play every week. "At Bayern the chances of playing are bigger, they told me, with Ballack gone and Owen Hargreaves close to leaving the club." But it now appears Hargreaves, who is under contract until 2010 at Bayern, will have to put on hold a move to the Premiership until at least January.